re: Now that Wade is back...Posted by Cadello on 4/15/19 at 1:06 am to ibleedpurpleandgold. re: Now that Wade is back...Posted by Tigers eyes on 4/15/19 at 1:42 am to ibleedpurpleandgold. I'd assume, since Wade met with LSU and the NCAA and both are satisfied with his answers, that Wade and LSU are cleared of any wrongdoing and there will be no investigation. Now Wade can explain things to these recruits and put an end to all the negative recruiting that's been going on and people claiming Wade will be fired and LSU will put on probation. After all this I see no reason why any recruit that was intending on going to LSU changing their mind. 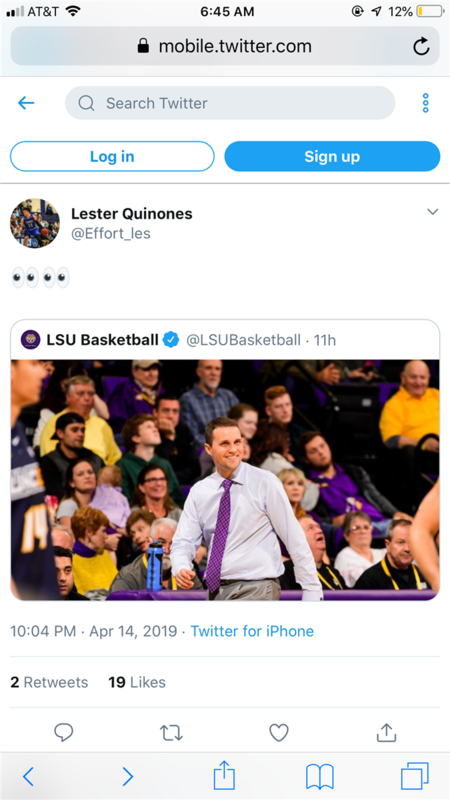 I'm sure these recruits were fed all kinds of BS by recruiters that LSU is a dumpster fire, Wade will be fired, players are all leaving, assistants leaving and etc., but now that the smoke is starting to clear and LSU and the NCAA know the entire story and that WW has done nothing against NCAA rules, I'm sure the recruits that had LSU number one still have LSU number one. I still like Watford, Sy and Quinones to LSU. And I believe Emmitt, Smart and Mays will be back. We've known and expected Naz and Tremont to go pro, this is no surprise. As far as I'm concerned we are exactly where we would be if Wade was never suspended. Actually we may be in a better situation now since the NCAA was involved and found no wrongdoing by Wade. Now this crap can't be held over our heads. Watford most important recruit on our board. Q would be nice, but Watford and Sy would be huge given that only big man returning is Cooper. I agree about Watford being the most important since he will be a stretch 4, but we need more shooting. Quinonnes could be one of the best shooters on the team next year if we land him. re: Now that Wade is back...Posted by glenoaks on 4/15/19 at 6:51 am to ibleedpurpleandgold. Will Wade is the fricking man! I say we are getting Watford, Su, and Quinenos! Give him a week or two. Don't forget transfer portal as well. Daryl Edwards made a bad decision. He chooses Nevada and now Musselman left.